Cakes with berries are not only tasty, but also very useful. Bake them from fresh and frozen berries. Bake cherry pies - delicious and rich in vitamins cakes. 500 g of pitted cherries. 300 g pitted sour cherries. Put in a saucepan 1 Cup of sugar and add 2 eggs. Whisk all with a mixer until the sugar is dissolved. Add to eggs beaten with sugar, 1 Cup sour cream. Mix. Add to the pan the rest of the ingredients 0,5 teaspoon of baking soda. Carefully stir the mixture. Add to the pot 1 Cup of flour and stir all until complete disappearance of lumps. Cover a baking sheet with baking paper and put on it 500 g of washed and drained cherries. Cover the cherries with cooked dough. Place baking sheet in oven preheated to 180 degrees. Bake the pie until Golden brown, about 25-30 minutes. Get ready cherry pie out of the oven. Cool it in the pan. Cut cooled cake into serving pieces and place on a plate with cherries up. Heat 200 ml of milk. Whisk 1 egg and 150 g of sugar until the sugar is dissolved and the volume increases by 2-3 times. Combine the eggs and sugar with warm milk. Melt 60 g of margarine and add in a bowl with milk, eggs and sugar. Mix everything until smooth. Quench vinegar 1 teaspoon of baking soda. Add it to the dough. Add to this mixture, 200 g of flour and mix. Grease a baking dish with vegetable oil and pour into it the dough. 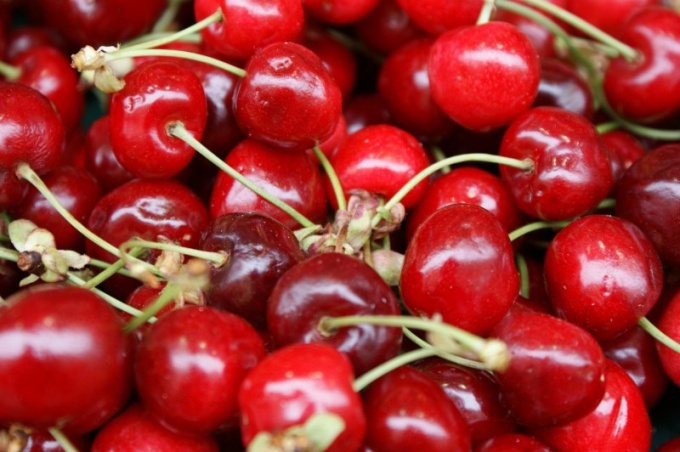 Evenly spread 300 g cherries, pitted on the surface of the dough, slightly pressing it the berries. Remove the form with the finished pie from the oven, cool slightly before him. Slice pie into serving pieces, arrange on a plate and serve drinks according to your taste.